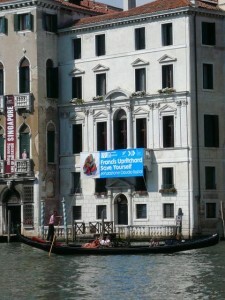 Avid art blog followers will now be familiar with Creative New Zealand’s NZ at Venice blog site. The project curators of Judy Millar’s Giraffe-Bottle-Gun and Francis Upritchard’s Save Yourself, and the venue attendants have been blogging regularly since the beginning of the installation period. 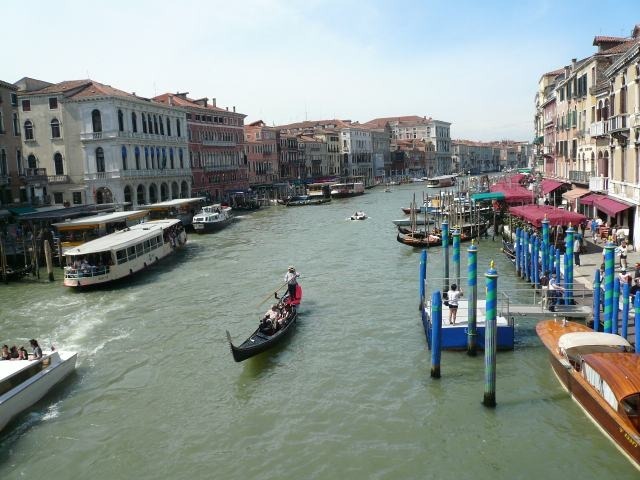 Posts are coming in thick and fast and it’s great to be able to get a sense of the daily life in Venice during Biennale time. So now it’s my turn on behalf of Te Papa to post a report on the 53rd International Art Exhibition, known as the Venice Biennale, after my recent visit. 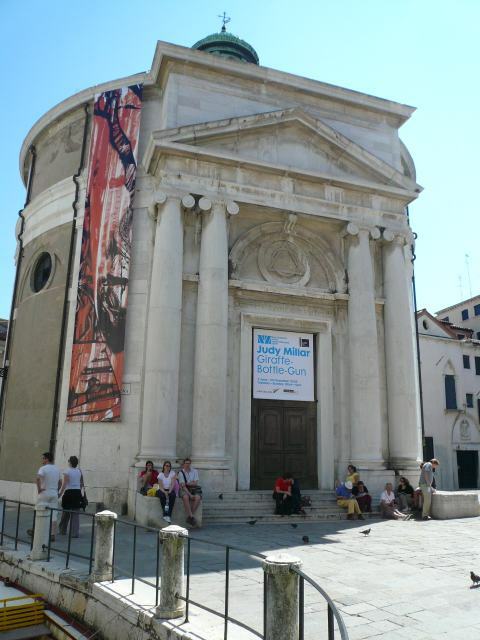 I was in Venice between 1 – 8 June to view Judy Millar and Francis Upritchard’s projects and to support them at the openings along with the folk from Creative NZ. It was a wonderful time to be there in the lead up to the openings and vernissage period that kicked off in earnest on 4 June. The projects both look great in their respective spaces and they respond really well to the architecture. One of the amazing things about Venice is the architecture and the ornate interiors that are usually inaccessible except during Biennale time when many of them are opened and used for exhibitions. In Save Yourself, self absorption that shuts out all else seems to be the common thread between Upritchard’s figures. 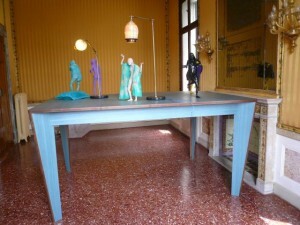 The installation is in three parts – one for each room of Uprtichard’s space in the Palazzo Mangilli-Valmarana – each part unified by a table either scaled up or otherwise subtly altered by Upritchard from her own furniture or other tables she likes. The figures on each table ignore each other. They are placed so that they are facing outwards. Each named figure has its own character seen in their expression, colouring, posture and features. 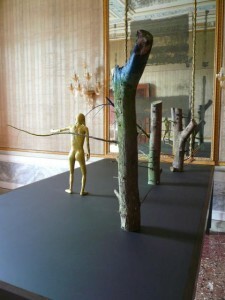 Upritchard has commented that she thought long and hard about how to work with the opulent space and her use of the mirrors adds to the distance and self interest of the figures. Several of the figures are facing the mirrors and their separateness from their fellows becomes emphasised by their apparent interest in watching themselves. Yet they are fascinating to look at, as curator Heather Galbraith writes in an essay in the new publication Save Yourself that ‘the seekers in Upritchard’s work are fallible, engaging and charming’ and she goes on to say that Uprtichard acknowledges Hieronymus Bosch and Pieter Bruegel as influential here. Additionally Uprtichard references Erasmus Grasser’s Morris dancing figures among other things. Judy Millar’s Giraffe-Bottle-Gun is in the beautiful La Maddalena alongside the permanently installed paintings. In 1990 Millar studied in Italy and it was a formative period for her as she absorbed the numerous paintings in churches and, as written by Anthony Byrt in the new book Judy Millar You You, Me Me, published in time for the Biennale, Millar ‘decided that painting had contemporary potential’. Byrt goes on to explain that this type of painting brings performance, illusion and material fact together with the purpose of the buildings. 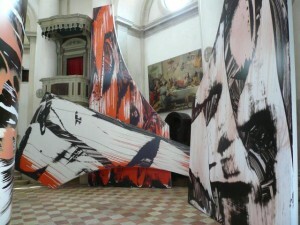 Millar’s large scale shaped canvases certainly operate similarly although their purpose within the church architecture is not the same. 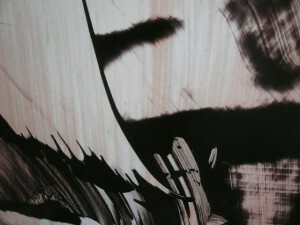 The works are scanned and scaled up ten times from paintings of Millar’s and reproduced on billboard canvas. The effect of enlarging the gestures and the size of the paintings is quite spectacular. What surprised me is that although they dwarf the viewer, they are not overpowering or overwhelming but are really approachable and even welcoming.The play with scale in both artists’ projects is appropriate for Venice, which is a place of oddly shifting scale in relation to the human – you find yourself emerging suddenly from narrow alleys into open piazzas or from a maze of streets and stone to unexpected water views. 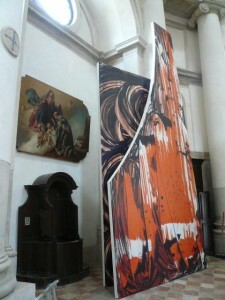 Millar’s towering gestural paintings against the white stone of the circular La Maddalena and the dramatic figures of the paintings. Millar’s colours are carefully chosen and the orange matches almost exactly the colour of the robe of one figure, the flesh colour is close too. Some of Millar’s enlarged gestures echo the figures movement, one looks almost the same as the sweep of an angel’s wing.You may have already heard that Te Papa will be showing both artists’ projects in February 2010 to coincide with the New Zealand International Arts Festival here in Wellington. Of course when we exhibit the projects back here at Te Papa we won’t be recreating the ambience of the Venetian spaces, the works will be in the Level 5 high stud gallery spaces where Toi Te Papa is.